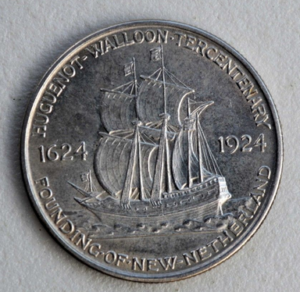 ¶ 3 Leave a comment on paragraph 3 0 Huguenot-Walloon Tercentenary Commemorative Silver half dollar (1924, eBay)The silver half-dollar coin, minted by the Commission, included the phrase “Founding of New Netherland” below the announcement of the “Huguenot-Walloon Tercentenary, 1624-1924” alerting those purchasing the commemorative coin of the significance of the celebration. 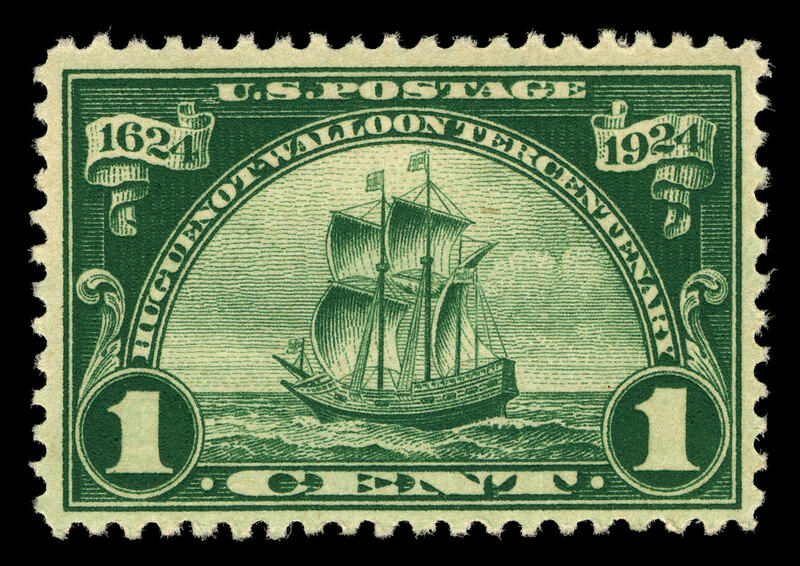 The stamp series, however, was not well described in print, baffling collectors and citizens confronted with the Huguenot-Walloon issues. 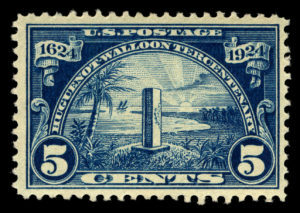 ¶ 5 Leave a comment on paragraph 5 0 Deciphering these stamps proved challenging for all, without readily-identifiable images. 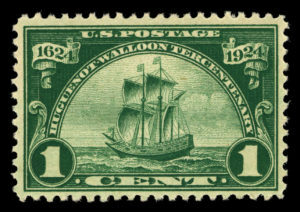 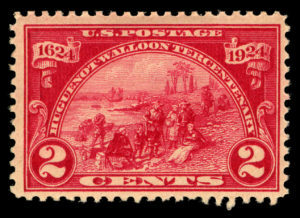 On the 1-cent issue, the Nieu Nederland sailed in 1624 east towards America, and families landed in the 2-cent stamp with no visual aide indicating where the ship sailed from, where it landed, or who the Huguenot-Walloons were. 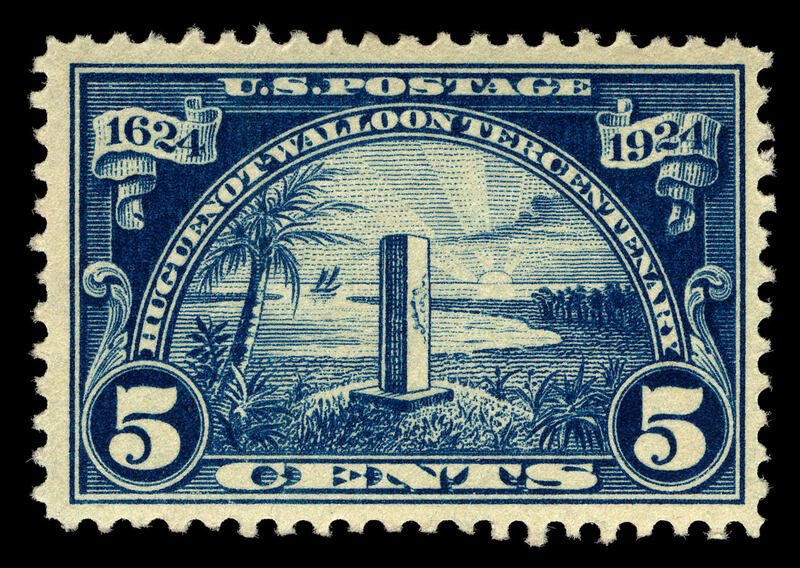 ¶ 9 Leave a comment on paragraph 9 0 The Huguenot-Walloon Tercentenary committee specifically wanted the memorial commemorating Jean Ribaud’s settlement to appear on a stamp representing the first Protestant settlement in America. 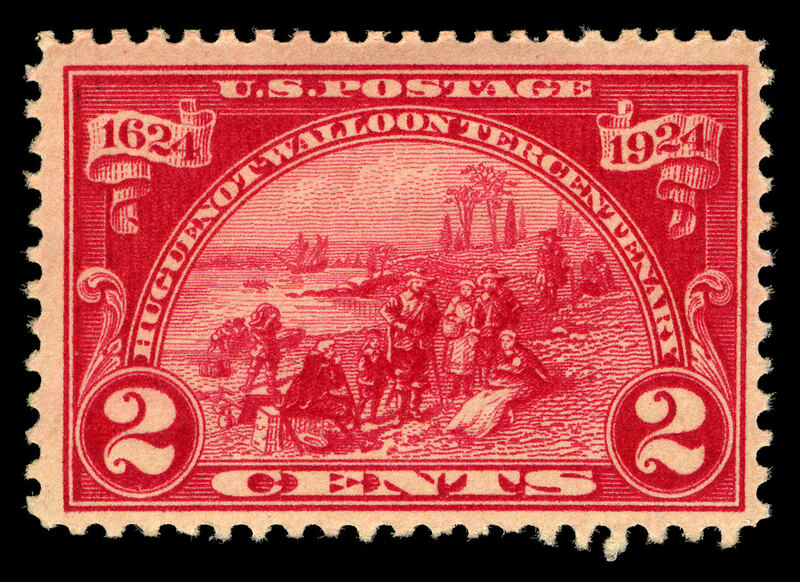 Seeking to redefine the chronology and attribution of religious tolerance in colonial America, they claimed that the Huguenot Walloons brought with them a strong commitment to religious tolerance that “neither Pilgrim nor Puritan possessed.” Descendants of Huguenots and Walloons desired the stamps and the celebration to counteract the “forgetfulness” of the “names and race of its founders” due to lost records.4 With the endorsement of the federal government, this stamp series helped the anniversary committee to make a claim on New York’s colonial history and positioned the Walloons among America’s earliest religious pilgrims.